Love the Falconcrest glove; very comfortable and perfect size. Speedy delivery, too! Thank you! Fantastic service and pleasure to do business with. top class goods at affordable prices. Thanks Brian. Nice man, nice family, always good to put a face to a dealer. 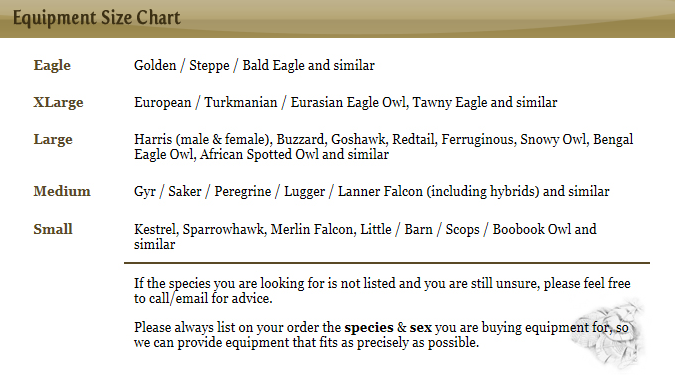 Had everthing there, was on the site and was very helpful as I'm new to falconry and wasn't quite to sure about some things. I use 2 suppliers- one for false Aylmeris (which Brian doesn't make) the second one is Brian (for everything else) I cannot thank you enough as evidenced by my posting a second comment... Thanks Brian and keep your dear wife mowing the lawn...!!!! Great surprise to find a business selling falconry furniture and tools on my doorstop. Just 'popped' round and came home a very satisfied customer. Welcome to Cornwall and wishing you every success. Received the items I ordered, very quick and speedy service and delivery. Quality customer service and quality products. Keep up the great work Brian and Becci! I happen to be one of those orang-outangs that you mention in your sizing scheme. And proud of it as I can reach things most folks only wish they could at any moment - just a touch under 6'3" as well. No worries I love the poke as it is honest and to the point. Love your site and products that you provide. All the best and good luck in your move. Chris (retired RCMP)....Brian's reply... Thanks Chris, I'm also one of those Orangs so we need to stick together!! Kent is just not the same without you all but what is Kent's loss is Cornwall's gain! Hope you are all settling in well and all the very best for now and in the future. Miss you lots! How will we cope without that wonderful sense of humour to keep us going?! Brian, you are a star! Phoned order 18th August arrived next day. Unbelieveable sevice considering the upheavel with your move and quality kit as usual. Would like to say a big thank you. First time of using your site, telephoned Thursday morning to place the order and couldn't believe it when it arrived by 9.00 am Friday!! Will not hesitate to order from you again. Fantastic glove the Falcocrest Deerskin is,so comfortable. Thanks, Brian - great furniture, great price and great service as always. Just like to thank Brian for swift delivery of my orders and thank him for the benefit of his knowledge sorting out my questions. Also having a good chat on Barn Owl matters relating to anklets, leather, neatsfoot oil etc.